Kubernetes is increasingly the application infrastructure solution of choice for modern enterprises who want to decrease their time to market for software projects, reduce infrastructure costs, and increase software quality. Because Kubernetes is so new, IT teams everywhere are learning how to operate and maintain apps running on Kubernetes in production. One common task that this blog will explore is migrating Kubernetes applications to a new cluster when additional capacity or capabilities are needed. A bare metal cluster is becoming resource constrained and you need to migrate workloads to a new suite where there is more rack space for compute and growth. Services you wish to use are available in another region or cloud but to use these services, you need to move apps and your data. It’s time to refresh your hardware to the next generation and the specification or requirements for compute and memory capacity have changed, necessitating a migration. A cluster is becoming resource constrained and scaling out is becoming increasingly expensive with more instances, so you want to switch to a new cluster architecture that uses network-attached block storage instead of local disks so that you can scale storage independent of compute. Developers wants to be able to move workloads to a different cluster for Test or Staging that uses different hardware, network, operating systems, or other configurations. 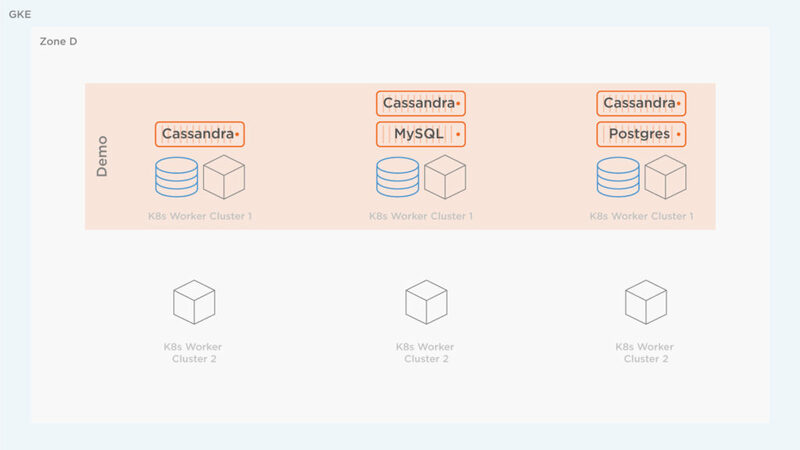 The above list is certainly not exhaustive, but it illustrates that there are various cases where it makes sense to augment a Kubernetes environment and migrate workloads from one cluster to another. This is a fairly trivial problem when an application is stateless, but for stateful services like databases, queues, key-value stores, big data and machine learning applications, you must move data to the new, augmented environment, before your application can be spun up. Solving the data mobility problem is the prime driver behind one of the latest features of PX-Enterprise™. PX-Motion not only includes the ability to move data across environments but also the application configuration and associated stateful resources such as PVs (Persistent Volumes) so that an operations team can easily move a volume, a Kubernetes namespace, or an entire Kubernetes cluster between environments, even when there is persistent data. In this blog we explore the features and capabilities of PX-Motion. Specifically, we will demonstrate how to move a Kubernetes namespace and all the applications running in it to a new Kubernetes cluster with expanded capacity. In this demonstration, Cluster 1 will represent an over-utilized and inflexible configuration that no longer meets the needs of our growing set of applications. Cluster 2 will represent a more flexible and scalable cluster that we will want to move our workloads to. In addition to moving an entire Kubernetes namespace between clusters, we will show how we can migrate an application that’s configured to use local storage in Cluster 1 to Cluster 2 which is configured to use network-attached block storage. This way, you will see that we have to move the actual data, and not rely on any tricks associated with simply managing block device mappings. Once data and configuration migration is complete, Kubernetes will automatically deploy the applications in the new environment. For the demo, I will use Google Kubernetes Engine (GKE) for the Kubernetes clusters but you can do the same thing outlined below in any Kubernetes cluster. Portworx will be installed on each cluster via a DaemonSet spec from the Portworx installer online spec generator. Walking through the installation options and installing Portworx is out of scope for this blog post, but please visit the documentation for how to install Portworx on Kubernetes for more information. In this scenario, the first cluster (Cluster 1) is becoming resource constrained and the operations teams want to move away from using Local SSD to auto-provisioned Persistent Disk (PD) as well as a larger instance size. Portworx itself helps abstract away some of the above restrictions because Portworx replicates data to other hosts in the cluster providing HA. However, using local storage is overall still slightly limiting if we expect that we will want to add additional storage to our cluster over time, without scaling compute proportionally. The second cluster mentioned above on GKE uses a Portworx Disk Template to automatically allow Portworx to manage disks from Google Cloud, which is more flexible than local disks. The second cluster is spun up in advance and is now using auto-provisioned PDs and is ready for migration of workloads. The source cluster is shown below. It has a bunch of applications running on it in a single namespace: Cassandra, Postgres, WordPress, and MySQL. All these applications are creating high load for the cluster. Below, you can see what’s running in the cluster under the demo namespace. Remember, it is possible and common to run multiple namespaces on a single Kubernetes cluster. In this demonstration, we will move a single namespace only, leaving any other namespaces running and untouched. At a certain point, when adding more applications such as a MySQL database, the cluster hits memory limits and receives errors such as “OutOfmemory” as seen below. To solve this, we will migrate the namespace demo to the new cluster to augment the capacity of available resources to the demo namespace. In addition to PX-Motion, the latest release of PX-Enterprise also includes PX-Central™, a single pane of glass for monitoring, metrics and management which deploys Grafana, Prometheus and Alertmanager along with Portworx itself. These dashboards monitor volumes, clusters, etcd, and more. In this case, taking a look at the cluster level dashboards will help identify issues with resources. The screenshot of PX-Central below shows the Memory and CPU that the cluster is using. The high CPU and Memory usage for this cluster poses a problem for scaling and is likely causing the OutOfMemory errors seen above since the cluster seems overloaded. Now that we’ve identified the problem, let’s perform the data migration to the new cluster using PX-Motion. First, we will walk through steps to pair both GKE clusters together and enable migrations between the source and destination cluster. Pairing our clusters is similar in concept to pairing a bluetooth speaker to a mobile phone. The pairing process lets us connect these distinct devices together. To migrate the workloads from Cluster 1 to Cluster 2, PX-Motion needs to be configured. The first thing to do is configure the destination cluster. To do this, first setup access to pxctl (“pixie-cuttle”), the Portworx CLI. Below we show how pxctl can be used from a workstation with kubectl access. Next, setup the destination cluster so that it is ready to pair with our source cluster. To do this, the destination cluster should first run a Portworx objectstore. We need to set up an object storage endpoint on the destination cluster because this is where our data will be staged during the migration. Then, produce a token for the source cluster to use during the pairing. When using GKE, before applying the cluster we need to add permissions to Stork. Stork is the OSS intelligent scheduler extension and migration tool for Kubernetes used by PX-Enterprise and will need to know how to authenticate to the new cluster in order to successfully migrate applications. First, create a service account using the Google Cloud instructions found here. Then, edit the Stork deployment and authentication to make sure it has access to the destination cluster. You can find those instructions here. Next, apply this cluster and pair the source cluster but using kubectl. Once applied, check the status of the cluster pair using storkctl which should have been set up during prerequisites. 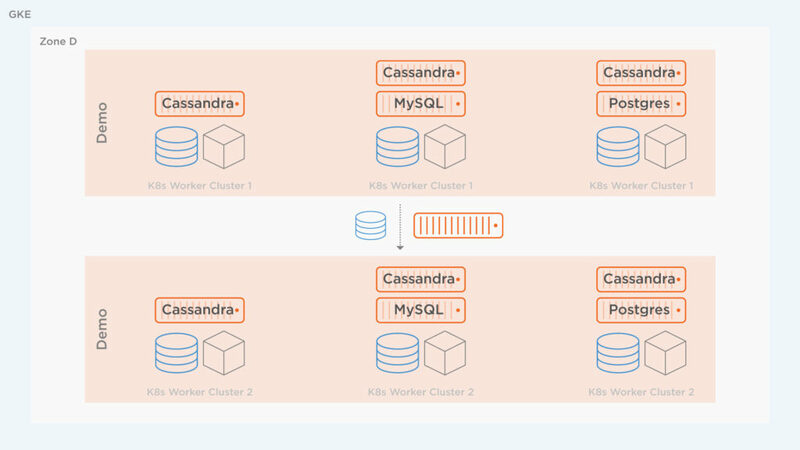 The cluster pair is also available using kubectl and pxctl. Next, there are two ways to initiate a migration: via the storkctl create migration CLI, or by referencing a spec file that describes the migration. We used the second option, shown below for the migration of the demo resources and volumes. Use kubectl to create the migration by referencing the above spec file. To get details about which resources such as Volumes, PVCs, Statefulsets, ReplicaSets are “InProgress” and or “Complete,” use the kubectl describe command. The status of the migration is also viewable from pxctl of the source Portworx cluster. Now that things are migrated according to the status of the cluster migration resource, the following diagram depicts what has been performed. The namespace, applications, configuration and data from Cluster 1 have now been migrated to Cluster 2. Next, take a look at the destination cluster to make sure the applications are actually there and are successfully running since we used the startApplications: true attribute. Great! All applications are running! Head back over to the PX-Central Grafana dashboards and see that the workers are using much less memory and CPU on this cluster. This screenshot shows CPU and memory for worker nodes in the cluster to which the workloads were migrated. This is the exact result we were trying to achieve. Below we see the amount of CPU and Memory available between Cluster 1 and Cluster 2 on the GKE dashboard so the results above make sense. Now that we have extra capacity, we can create the extra MySQL database we wanted. The database should have enough resources on the new cluster to launch successfully. The benefits of the cluster augmentation use case are immediately visible. Users or operators can delete the old namespace or applications from the source cluster or delete the whole cluster in general and reclaim those resources. The new cluster now uses auto provisioned PDs instead of Local SSD so operators can be assured that the storage as well as the compute can scale with the needs of the IT teams. PX-Motion introduces the ability to migrate Portworx volumes and Kubernetes resources between clusters. The above example takes advantage of PX-Motion by enabling teams to seamlessly augment their Kubernetes environment. Migrating namespaces, volumes or entire applications between environments on Kubernetes has never been easier. Augmentation isn’t the only use case for PX-Motion, check out our other blogs in the Exploring PX-Motion series.